Bike-share programs (rental bike stations) are intended to reduce traffic and the carbon footprint of large cities by providing locals with one-way rides to a destination point, usually their job. Bike-share programs (those rental bike stations) are intended to reduce traffic and the carbon footprint of large cities by providing locals with one-way rides to a destination point, usually their job. Traditional bike rentals (like Wheel Fun Rentals) serve the leisure and recreational riders and families that want to explore the city and take in the local sights. Recreation rentals are focused around fun, family, great customer service, and are a better buy, we’ll tell you why . . .
Wheel Fun Rentals has straightforward low pricing with no hidden fees – standard bikes start at $10 an hour, $22 for a half day (4 hrs), and $27 for a full day (8 hrs). It’s important to read the fine print when renting from a bike share. Bike-Share pricing is typically low for the first hour or less, but then increase significantly after that. They are designed for short trips so they penalize you for taking the bike for longer periods of time. Take Louisville’s B-Cycle for example, a day membership is $9 and you get the first 30 minutes for free, but go over the time by one minute and they start charging you. A one hour rental is $14, a two hour rental jumps to $24, and they continue to charge you $5 for every 30 minutes thereafter. So a 3 hour rental is $34, a six hour rental is $74, and their full day rate is $84! Bike-share systems only provide one size bike; they are twice as heavy as a typical bike, plus they only have one gear. Wheel Fun Rentals has a plethora of bikes that fit all different shapes, sizes, and age groups. Choose from cruiser bikes, hybrid bikes, tandems, and family bikes like our Surrey. We have what you are looking for! And we’ll assure you get the right size; adjusted to you for greater comfort, optimal pedaling efficiency, and maximum safety. 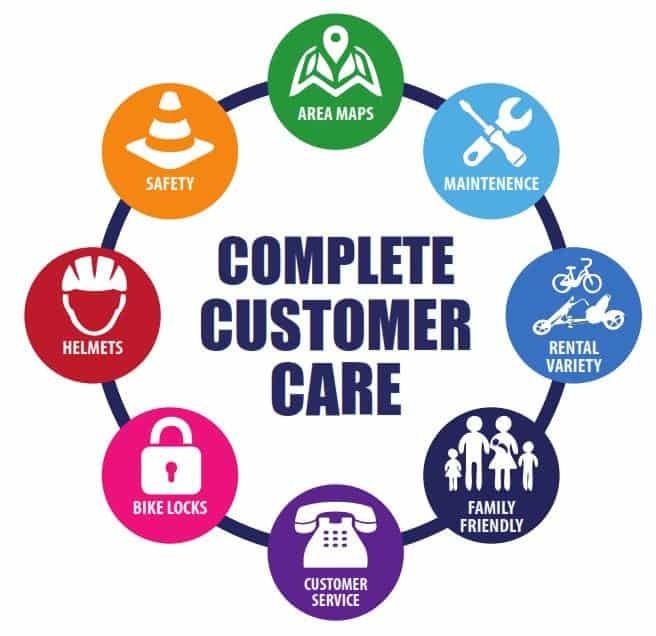 Wheel Fun Rentals provides maps, bike locks, helmets, bike bags & baskets (a place for you to put your stuff), self guided tours, and other items to make your journey safe and enjoyable. Try exploring the city with a bike-share bike: you’ll receive no helmet, no map to show you where to go, and no way to lock the bike up if you want to shop, walk around, or stop for lunch. Tags: Louisville B-Cycle, BCycle, Louisville Bike Share, Bike Sharing System, hop on hop off bike rentals, bike kiosk, bike rental thing, bike station, bike rental, bike share, bike drop, bicycle station, bicycle rental, bcycle.